But therein lies the problem. Curating becomes a massive exercise. I now regret that I didn’t start my research a year ago. But I genuinely thought I’d have more time. 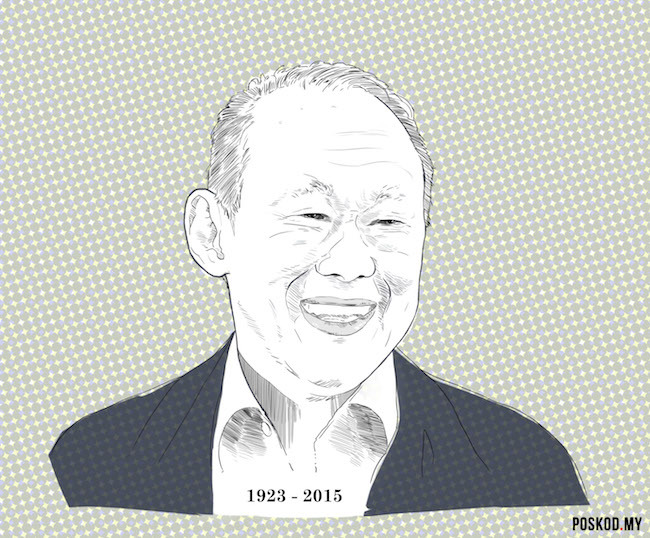 Like many other Singaporeans, I am still having trouble digesting the fact that he’s left us before our 50th birthday. Finally, how does one come to a conclusion about his legacy? The good, the bad and the ugly? Having read the responses to my first piece, I realise that there are so many subjective views out there, mine of course included. One reader’s “balanced piece” is another’s “one-sided commentary”. I guess the important thing to note, as with history’s other legends, from Gandhi to Thatcher, is that there will never be one conclusion. Our understanding of these people will simply become richer and more sophisticated with the passage of time. It is crucial, then, that we encourage a diversity of views. And this is where I have some trouble with traditional, conservative Singaporean society. One of the most shocking reactions I’ve seen this week is from people suggesting that Op-Eds, obituaries and reflections on Mr Lee should steer clear of anything negative. Apparently, this isn’t the right time. Not now. We should just mourn him and adulate him. Really? While the media is expected to write objective obituaries about every other personality, when it comes to Lee Kuan Yew, only the positive. The negative can come later, much later, or maybe never at all. But why do we want to whitewash his legacy? That wouldn’t be fair to anybody. Not to the people he hurt; not to the Singaporeans whose dreams he crushed; and not to the millions who seek a holistic understanding of Lee Kuan Yew and Singapore. In trying to understand this reaction, I have three thoughts. The first is that we genuinely consider him to be our adopted father. “Ah Kong” is not just any other public figure. Nobody likes to hear untoward things about their own father. The second is that some Singaporeans may be confusing an obituary—which should strive for balance—with a memorial, eulogy, tribute or condolence note. This is partly because of our immature, sycophantic media, which has never published a proper obituary on any Singaporean leader. For those of you outside Singapore, it may not come as that much of a surprise to learn that for this entire week, Singaporeans have been hit by a wave of newspaper, TV and radio programming on how great LKY is. But not a single “balanced” view. The third is that Singaporeans don’t like having a mirror held up in front of us. For so long, we have accepted the many trade-offs inherent in “the Singapore consensus”—loss of liberty, loss of civic and democratic participation, scores of lives locked up without trial, etc. etc.—as necessary for growth, for stability, for progress. But what exactly did we lose along the way? And, more importantly, were those sacrifices really necessary? Most people here would rather not seek answers to that. That kind of introspection is for academics. Because life here is about bread, butter, and the next Ferrari. Thanks for writing this reflection piece. Articulates a lot of my own thoughts and helps me to feel alittle less ‘crazy’ in the midst of all the ridiculous sycophancy that’s going on now. I recently posted your poskod article on my FB wall and one of my friends who got into a political debate with me, mentioned that it was offensive and inappropriate that I posted the article at this time. For a brief moment I felt bad, then I thought, LKY shouldn’t be free from criticism or scrutiny even in death, because nobody is. A close family friend of mine, Uncle K, passed away 10 years ago. Even though I had very good memories of the times I had spent with him, at the wake, his nephew shared with my sister and me he was very harsh and impatient with them for the most part. I think he did this not out of spite, but because he saw how grieved I was and wanted to somehow comfort me and also give me a fuller picture of who Uncle K was. This not how I remembered him, however, when I really thought about it, it made sense and also gave me a deeper appreciation for the relationship he had with me and my family. I was able to accept what his nephew had said and acknowledge this aspect of him. It’s not that I had not seen that side of Uncle K before, but that I saw it only towards the end when he was riddled with pain and barely able to contain his frustration at so many concerned people asking him the same ‘annoying’ questions about his health over and over again. I was one of those ‘annoying’ people and the last time I saw him, Uncle K practically threw me out of his house because he couldn’t stand to see my sadness at his worsening condition. People are multi-faceted and if there’s good, there’s also bound to be some bad. Why is it so hard to admit that? Sometimes I feel like Singaporeans just can’t face up to the unpleasant facts about Singapore, preferring to maintain a whitewashed image of this country in their minds and on their Facebook feeds. Thanks for sharing this, appreciate the personal story. Yes, there is a lot of intellectual dishonesty in this country. I hope it is just because emotions are running high this week, and that eventually people will give an honest appraisal. But I’m not at all certain this will happen…people do, as you say, prefer the whitewashed image. Hi Sudhir thank you so much for writing this! It is definitely a welcome change from being repeatedly bombarded with LKY’s various accomplishments in the national and social media over this week. There is no denying that LKY has done wrong and made mistakes, this is fact and we need to see the whole picture of the man, reflect and learn from both his successes and his sins. Our history books in schools need to be updated to reflect this, and we should engage in mature, reasoned debate, both online and offline, about whether all that LKY did was necessary and/or justified. Thanks Mohan. Yes, you make an important point. If we do not separate his successes from his sins, how do we progress? On history in schools, I’m a little bit skeptical…will reproduce some interesting comments from a teacher friend in the next comment below. …but I regret to say there is much whitewashing in all the schools. The mass hysteria and assumptions made – we MUST grieve in these ways – we MUST get the students to write tribute notes is just completely unacceptable to me. …I half suspect the media and other arms of civil service, eg the education service will go into overdrive in an attempt to deify him – perhaps in a bid to leverage on emotions in light of upcoming elections. I’ve received about 5 Just-In-Time resource teaching packages and every morning has been tribute after tribute by staff and students and the usual untruths. Can only hope that it goes into overkill and people start looking for alternative truths. Interestingly, was speaking to a teacher from China – very smart woman – and expressed my irritation over the mawkish sentimentality and historical amnesia. Then she said something that made me realize that there could be cultural reasons behind the reactions of mourn now, talk later. It’s about this concept of ritual propriety – 礼 – in Confucian ethics. People can’t be talked to when they are emotional and hysterical anyway. …but I’ve gotten about 4 parents’ complaints about my views imparted to their offspring. The masses don’t want and not able to know – you aren’t completely wrong when you say some things are only the stuff of academics. To be fair though, many Chinese Ed people share your point of view – people of my dad’s generation – Chinese scholars who were victims at his hand. Especially Nantah students who were treated as second class citizens in relation to English Ed graduates who got the better jobs etc due to the implementation of English rather than Malay as a working language / allowing a plurality of working languages. Like I said, my conversations with them have gotten the same response – we have feelings but we think now’s not the time as the listener won’t listen. Quite interesting speaking to them. Huang Jianli has written two really good journals on LKY’s schizophrenic and opportunistic maneuvering of the Chinese card.